Lesley Parlane is Dakota/Salteaux (member of Standing Buffalo Dakota First Nation) and is an urban Indian. She’s been a guest on unceded Algonquin territory for seventeen years and travels regularly back to Saskatchewan to reconnect with her extensive biological family. 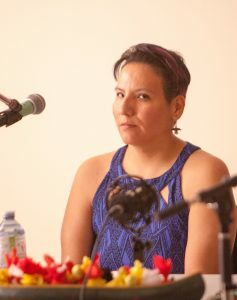 She is a 2012 graduate of Center for the Indigenous Theatre’s Summer Intensive Program and has been steadily working at her storytelling craft. She regularly uses her own life experiences for the basis of her storytelling. Her story explores her life experiences as an Indigenous woman living in Canada. These experiences include: being apart of Inter-Generational Residential School era, being a 60’s Scoop adoptee, reconnecting to her culture, alcoholism, sexual assault and violence against women. Since 2012, she’s been working hard to develop a storytelling show based upon the 60’s Scoop called: “Voices From the Adoption Files” for presentation in cooperation with the Ottawa Storyteller’s Speaking In/Speaking Out Series at the NAC’s Back Stage for March 16th, 2017.